Just an hour or so away from Bellingham, WA, is another world, one of trees, big mountains, and rushing rivers. On a warm fall day, a drive up Mt. Baker Highway SR 542 will take you to the Mt. Baker-Snoqualmie National Forest. An unnamed bridge crosses the fast running glacial melt waters of the North Fork of the Nooksack River near the Douglas-Fir Campground. This bridge is in the Pacific Northwest rainforest. The annual rainfall is about 67 inches per year, with snowfall of about 43 inches. That makes for lots water in almost all seasons. With all that moisture, even a concrete structure like this bridge becomes home to mosses and other hardy plants. There has been a lot of controversy in Bellingham about the building of a coal shipping terminal at Cherry Point. Even is this never comes to pass, there are still coal trains traveling the rails heading for British Columbia's Westshore Terminal at Robert's Bank. The primary destination for all that coal is China. This week I'm sharing a picture I took last April in the Steveston Harbour. This commercial fishing boat caught my eye. The Milbanke Sound is (or at least was) owned by the W.E.R. Fishing Company. She's named after an open sea portion of the Inside Passage north of Bella Bella. The Milbanke Sound participates in the BC-Canadian Albacore Fishery and also has a license for Canadian Sablefish, a small sleek high fat content fish that is mostly exported to Japan and Hong Kong, but is acquiring a larger Canadian and US market. Because my daily schedule requires lots of indoor time, it's important to get out into nature as much as possible. Sometimes I don't have enough time off to do an overnight trip or return to our float cabin home, so a quick day trip has to do. Bellingham, WA, has some great places that can be reached in a short amount of time. 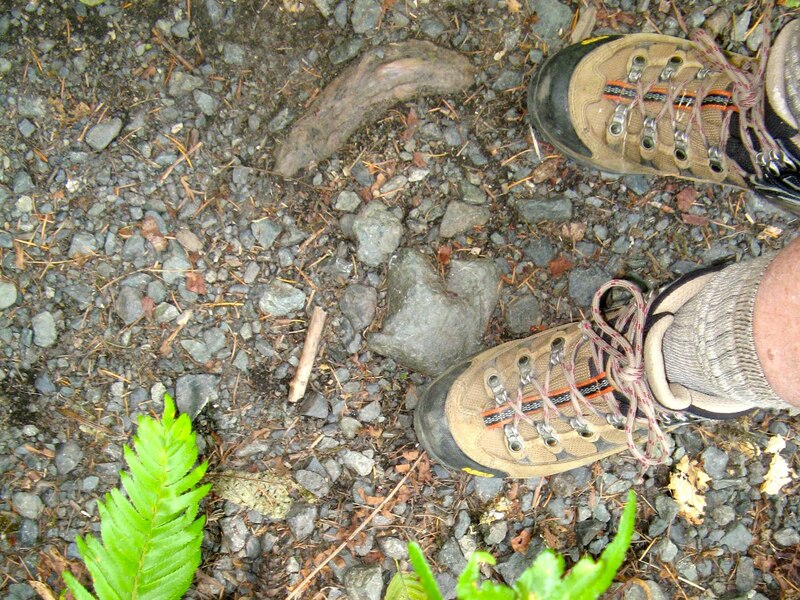 The well maintained trail was built by the United States Forest Service and the Whatcom County Trail Work Crew. It has several stairs, bridges and causeways to make it easy to moderate hiking. I saw a few others, but most of the time I had the forest and river all to myself. What a relaxing afternoon. I filled my backpack with a towel and lunch makings. The trail intersects with the Nooksack River at several points. Because the water is low right now, a few spots have large boulders exposed. I pulled up a rock, used my knee as a table, and ate my open-faced crackers sandwiches to the soothing sound of the rushing water. The day I went to Sasquatch Provincial Park, the weather was sunny, warm and calm. That made for some excellent reflections on the surface of Deer Lake. This was the view I had for my picnic lunch. On my mini-vacation to Sasquatch Provincial Park last week, I took a walk along the shore of Harrison Lake. As the name implies, this is supposed Sasquatch, or Bigfoot, territory. And Harrison Hot Springs capitalizes on the fact in business names and advertising. Here's another shot of the wonderful, blue sky over Deer Lake in Sasquatch Provincial Park in British Columbia. A little later in the evening, the golden sunset started to bring out the fast changing leaves. While I don't know much about this boat, I thought it was appropriate for this week. Well, almost. When I selected my campsite at Deer Lake, I didn't realize it came with a plethora (I rarely have a need to use that wonderful word) of Steller's Jays. I discovered their presence when one descended from the trees and started pecking at my chip bag. Once I figured out where the pecking sound came from, I shooed him away. That's when I discovered that the trees were filled with "blue fruit." I delayed my picnic hike to watch them. Jays are opportunistic birds. I'm sure they travel from site to site looking for leftovers and unguarded food. When no human food was produced, one Jay reverted to more natural behaviour. He flew to the ground and started pecking around. At first I thought he was looking for crumbs, but then he came up with a short stick in his beak. He flew back up into the overhanging pine and began pecking at a large branch with the stick. It sounded like a woodpecker, but with less volume. I assumed he was tapping to either dislodge or encourage insects to come out of their protective holes to be consumed. I tried to research this behaviour on the web, but didn't find any references except for crows. Since Steller's Jays are a member of the Corvid family including ravens, crows, and magpies, it isn't a far stretch to imagine them actively using tools. Last week I used the good weather to squeeze in a solo camping trip. It's a two hour drive from Bellingham, WA, to Sasquatch Provincial Park at Harrison Lake, BC, (depending on the border wait). I went north on the Guide to Badger Road, east to the Sumas border crossing (they now have Nexus! ), and north to Canada Highway 1 eastbound. At Exit 135, I took Highway 9 north through Agassiz, Harrison Hot Springs, along the east shore of Harrison Lake, and finally a well-packed dirt road to Sasquatch Provincial Park. I first checked out the Hicks Lake Campground, but none of the vacant sites excited me. I went on to the Deer Lake Campground and found sites with foliage for privacy. I picked #16, just a short walk from the lake shore. The afternoon was warm, sunny and calm. I left the car to claim the site and filled my backpack for a lunch hike. The trail along the south shore had the most water access. The trail passes through some moist, swampy places. Bridges and causeways protect the environment and make this trail easier to hike. Today I had it all to myself. There were some of the largest Skunk Cabbage plants I've ever seen. Spring must be beautiful (if a bit stinky) here. Looking back towards the campground in the waning light was beautiful. When I got back it was time to set up camp. I brought a small tent, air mattress, sleeping bag, camp chair, flashlights, everything I would need for a comfortable night. Fortunately, the campground wasn't full and the campers were quiet. It made for a relaxing evening. 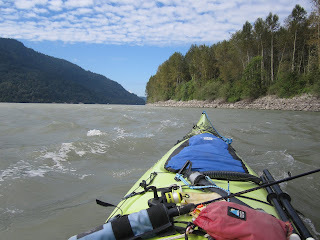 Over the Labour Day long weekend, I went to help Wayne retrieve his kayak after a three day solo paddle down the Fraser River. The boat ramp we used is right next to the Mission BC Railway Bridge. While we were unloading his camping gear, a freight train with a Canadian Northern engine crossed the Fraser River on it's way eastbound. The original bridge was built in 1891, and was the only railway crossing over the Fraser in the lower mainland until 1904. In the beginning, it shared it's span with car traffic traveling between Abbotsford and Mission. A parallel car bridge was subsequently built to reduce the lengthy waits that could occur for automobile passangers. At the bottom of the mighty Fraser River in British Columbia, lives a mighty and massive fish. The Fraser River White Sturgeon is a remnant of prehistoric times. The skin is covered with large bony plates rather than scales, and the skeleton is mostly cartilage. Barbels on the underside of the head help it find food on the river bottom, making up for poor eyesight. The summer crowds are gone, so Wayne and I decided to take a quick flying trip in 997. There are lots of interesting flying destinations nearby in the Pacific Northwest. For example, the San Juan Islands are just a twenty minute hop away. This week we returned to Orcas Island Airport (KORS) with our tent and sleeping bags in tow. We landed on Runway 34 with a slight headwind. The runway is 2900 feet in length, plenty of room even for our cityfolk Piper Arrow. There's a small terminal, but it's only open when a commercial flight is scheduled. If you go around to the front of the building there's a pilot's conference room that may be open. Inside you will find pilot information and space for flight planning. Transient parking is available on the tarmac or in a large grass area. If you're just coming for a day trip, park at the southeast corner. This is the closest location to the exit gate and trail towards town. If you want to camp, go the large grass tiedown area midfield on the east side. It is well maintained with clearly marked parking spots, some with hooks to attach your own ropes. There's a portable toilet next to the self-serve fuel building. And for those needing to file an international flight plan, there's free WiFi . Overnight parking is just $6 including camping. 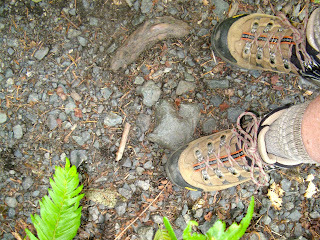 Last time we flew to Orcas we walked the well marked trail to the village of Eastsound. That time we ate a The Sunflower Cafe. This time we decided to try the Madrona Bar & Grill. It's right on the water with a quaint atmosphere and a fabulous view down the u-shaped sound to the south. Since we were spending the night, I could enjoy a Mac & Jacks with our leisurely meal on the deck. In the working boat section of Squalicum Harbor in Bellingham, WA, the Western Warrior is ready for a well deserved rest at the dock. I found a picture of a boat with the same name and contours by Alan H. Brown. His description said she was a seiner with BC registry through April 2011. If it's the same ship (and I believe it is), she was built in 1944 at Vancouver’s Coal Harbour by W.R. Menchions with rare sawn yellow cedar frames. At the time of Brown's picture, she was owned by Jim Pattison, the famous and wealthy Canadian entrepreneur. From her former Canadian registry, here's more information. She's 22.52 metres in length with a gross tonnage of 110. The powerful diesel engine pushes her up to 10 knots on the open sea. On the Labour Day long weekend, Wayne took a three-day solo kayak trip down the lower Fraser River. He used our Current Designs double kayak we lovingly call the Big Yellow Banana. When you see it on top of our white Ford Tempo you'll know why. 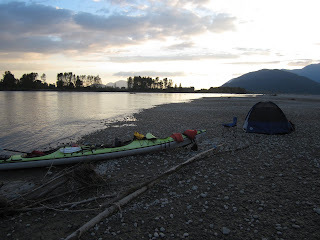 The trip started at an informal boat launch/camping spot just west of the Rosedale-Agassiz Bridge on Highway 9. When Wayne arrived on Thursday afternoon, it was almost empty. When we returned to retrieve the Tempo on Sunday, it was packed with holiday outdoor enthusiasts. The Rosedale-Agassiz Bridge was built across the Fraser River in 1956. From 1953 when Highway 9 opened, travelers had to take a ferry across the river. Not as quick as a bridge for sure. Usually we have Barn Swallows nesting above our front porch under the peak of the roof. This year, we had no early season nest takers. We were afraid that our annual pair was either too old to return, or met an untimely death on their long migration from South America. Finally, in mid-August, we noticed the nest had been rebuilt. Even though it was late coming, this summer has been sunny, hot and dry. Because the forests are tinder dry, tighter fire restrictions began on July 20 for the Coastal Fire Centre including Powell River, BC. This is a good thing. I would hate to see our beautiful trees go up in smoke. People by and large are careful, but you just can't control Mother Nature and her lightening bolts. We got a few claps of thunder and bright flashes the last few days at the cabin, but no major fires began. Unfortunately, the rain was barely measurable. While I was in Mission BC to pick Wayne up from his three-day solo kayak trip on the lower Fraser River, I saw this interesting fishing boat in the marina. Mission is about 80 kilometres (50 miles) up river. I was surprised to see such a large fishing boat, but maybe she's undergoing some kind of conversion or renovation. Of course, her classic work boat lines first caught my eye, but then I noticed something unusual on her back deck where the net drum usually resides - a camper shell. Then as I looked farther forward, it appears that an enclosure is either being constructed or deconstructed on the main deck. Whatever the case, The Barkley Sound out of Vancouver BC is quite the ship.